Star Wars invasion over San Francisco! Apparently the galaxy far, far away is closer than we think! Who says an old dog can't learn new BEATS? As if the upcoming weekend wasn't enough to smile about, check out this Beat-Boxing Basset Hound! Turns out this was an ad for Tele2, a Swedish telecommunications company. Control your own Beat Boxing Basset Hound at www.beatbox.tele2.se and prepare to crack as grin or two as you make your hound the next Biz Markie. Sailor Jerry is having a Converse sale -- 10% off a pair -- enter code SJCONV, going on now until Sunday Aug 10. While you're there, check out their sale section filled with tees and other apparel for guys and gals. A few of my faves above: 1: Serpent Tattoo Tee. 2: Rocked Tattoo Women's Tee. 3: Unisex Skull Heart Tattoo Converse Skid Grip. 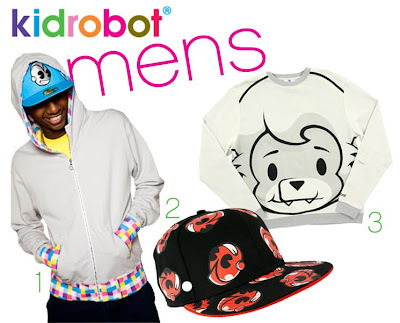 kidrobot is having their End of Summer Sale going on now until Sunday August 10...good lookin out, carmeL! Mens: 1: Gingham Hoodie in Ghost Gray. 2: KR HeadBlack Fitted Hat. 3: Fritz Face Crewneck in Ghost Gray. Womens: 1: Alfonzzo T-Shirt Dress in Pure Black. 2: 80s Print Bathing Suit in Black. 3: Yo Gabba Gabba Short Sleeve Hoodie in Egg White. 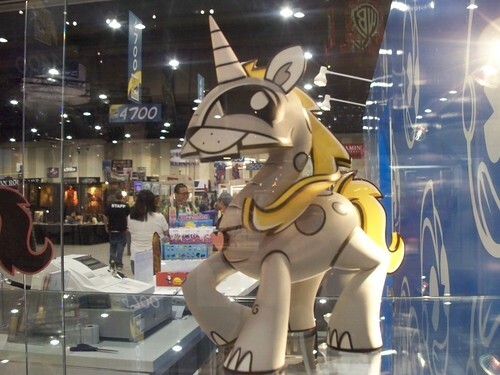 Toys: 1: Veil Specimen Kidrobot Healing Edition. 2: Tofu Swing Sweets Keychain Capsule. 3: Fire Bone Fly Monsterism Island. and if you're lucky to be in the L.A. area, check out Kendo's Summer Sale where they have kicks on discounted from 50%-75% off, going on now until Sunday, August 10. 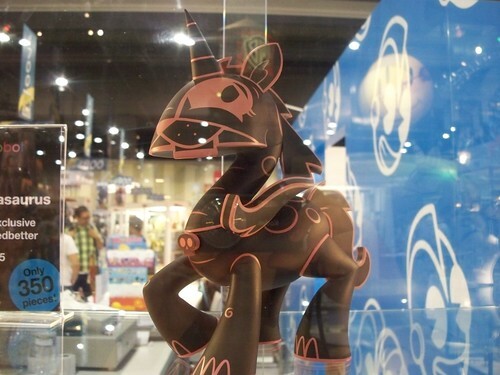 Joe Ledbetter's Unicornasaurus made it's debut at the Kid Robot booth during Con a few weeks back proving to everyone that the mythical Unicornasaurus does, in fact, exist. 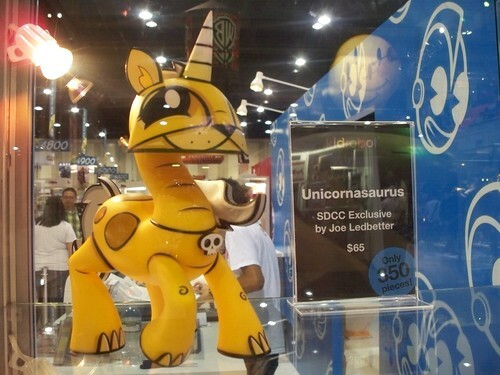 But TODAY is the release of the grey and yellow Unicornasaurus. 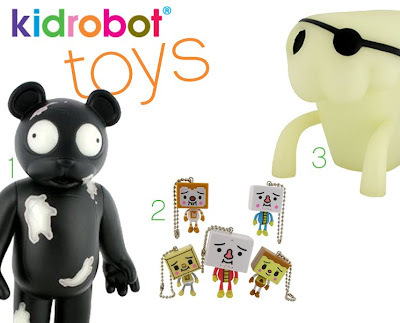 Catch one (or both) for $39.95 (+tax) at all Kid Robot stores before they disappear and go on eBay for a ridonculous price! 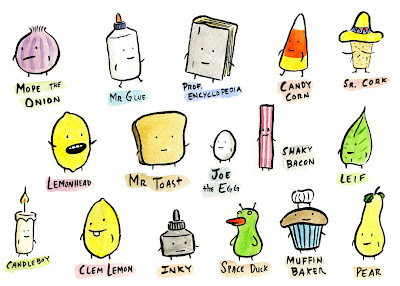 Dan Goodsell's Imaginary World and Mr. Toast! Dan Goodsell, creator of Mr. Toast and friends and Co-author of the book Krazy Kids Food, was once again present at the ComicCon, rounding it out with Mr. Toast goodness! In true ComicCon spirit, there were some renditions of Mr. Toast as some comic favorites like Iceman, the Thing, the Incredible Hulk and Neil Gaiman's Sandman! 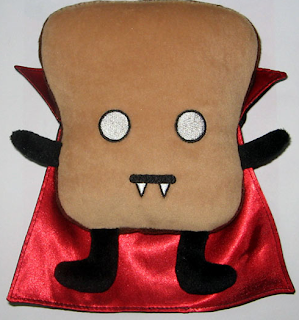 On hand were some limited Vampire Mr. Toast plush, ready to take a bite out of your boredom! 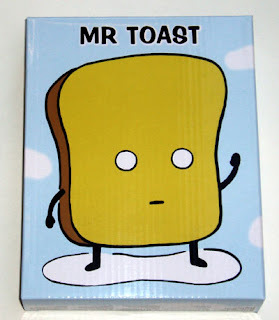 A very toasty Mr. Toast Vinyl Toy! 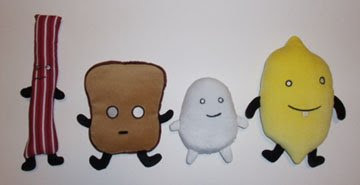 Joining Mr. Toast is Shaky Bacon, Joe the Egg and Clem Lemon! Here's my Mr. Toast and Joe the Egg dolls relaxing deliciously on a plate! 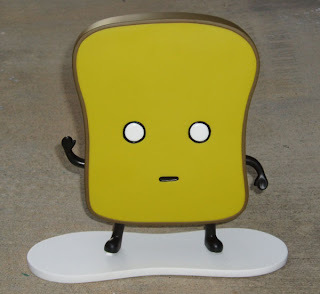 Check out more art, paintings, and webcomics featuring Mr. Toast and his friends at Dan theimaginaryworld.com and the Mr. Toast Blog for the latest. "Everyone is fun!"